The Days Inn Jacksonville offers a non-smoking room with one king bed, which provides comfortable and spacious accommodations for up to 2 adults, making this room perfect for couples. This air-conditioned room features a coffee maker, microwave/fridge, iron/ironing board, alarm clock, and flat screen TV with cable programming. The King Bed Room offers a work desk. This room type has a full bath with hairdryer. 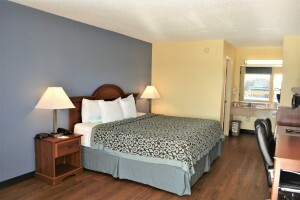 The Days Inn Jacksonville's non-smoking room with two double beds offers comfortable and spacious lodging for up to 4 adults, making this room perfect for groups or families. This air-conditioned room features a coffee maker, microwave/fridge, iron/ironing board, alarm clock, and flat screen TV with satellite programming. The 2 Double room offers a chair and desk space to get your work done. This room type has a full bath with hairdryer. Handicap Accessible version of the 2 Double Beds Room is available. 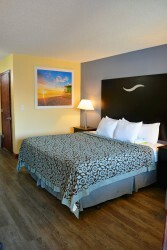 Handicap Accessible version of the 2 Double Beds Room is available. 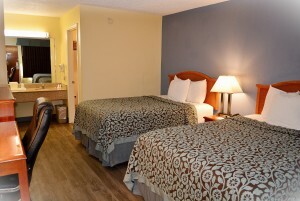 The Days Inn Jacksonville's smoking room with two double beds offers comfortable and spacious lodging for up to 4 adults, making this room perfect for groups or families. This air-conditioned room features a coffee maker, microwave/fridge, iron/ironing board, alarm clock, and flat screen TV with satellite programming. This room type has a full bath with hairdryer. 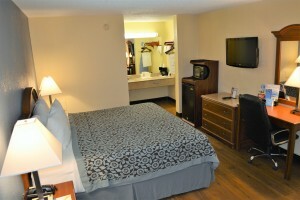 The Days Inn Jacksonville offers a smoking room with one king bed, which provides comfortable and spacious accommodations for up to 2 adults, making this room perfect for couples or solo travelers. This air-conditioned room features a coffee maker, microwave/fridge, iron/ironing board, alarm clock, and flat screen TV with satellite programming. The King Bed Room offers a work desk. This room type has a full bath with hairdryer. The Days Inn Jacksonville offers a non-smoking room with a king bed and a romantic hot tub, which provides comfortable and spacious accommodations for up to 2 adults, making this room perfect for couples. This air-conditioned room features a coffee maker, microwave/fridge, iron/ironing board, alarm clock, and flat screen TV with satellite programming. The King Bed Room offers a work desk. This room type has a full bath and a hot tub with hairdryer.